There is no wall protecting Canada from the populist tidal wave that washed Donald Trump to the presidency in the United States, as I argue in a new Macdonald-Laurier Institute commentary based on a talk I gave in Vancouver to the local chapter of NAIOP. The phenomena that delivered a stunning election result in the United States and a surprise vote to leave the European Union in Britain are – despite what some observers think – also happening here in Canada. I single out three areas where this conflict is already coming into the open: labour markets, immigration and housing prices. The Brexit vote last June and the recent election of a populist and anti-establishment American president are perhaps only the opening chapters of a new era of friction and even confrontation between the opinions of the Davos-inspired elites who have been in charge for decades, and those of the man and woman on the street. Think the conditions that led to Trump’s rise don’t exist here? Think again. In my Globe column I argue that typical Canadian smug moral superiority has no place in our assessment of Donald Trump and the political phenomenon he represents. Canada is not immune to the economic dislocation and policy arrogance that propelled Trump to the presidency. If we forget about those whom free trade, balanced budgets and higher productivity are leaving behind important parts of our population will be vulnerable to Trump-like appeals. To hear the chattering classes tell it, the election of Donald Trump is the End of the World as We Have Known It and over the gate to the new world is inscribed Abandon Hope All Ye Who Enter Here. What balderdash. 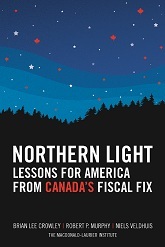 Life goes on and the Trump presidency, by making marginal changes to America’s behaviour and policies, will create both problems and opportunities for Canada. We should look at both in a calm clear-eyed fashion. Thus my Globe column (in the Report on Business’s Economy Lab feature) in the Remembrance Day edition focuses on three opportunities the Trump presidency offers: 1) reorienting wasteful “infrastructure” spending to thoughtful defence spending; 2) getting Keystone XL built and buying time to get our own pipeline approval process right; and 3) giving Ottawa political cover for a rethink on how to make our business taxation regime a competitive advantage rather than a drag on investment. In my February 5th column for the Globe’s Economy Lab feature I lay out what I think are two of the chief reasons to adopt the Trans-Pacific Partnership. The first is that it is a stealth modernisation of NAFTA and we cannot afford to let Mexico get these benefits while turning them down ourselves. Second, it puts tremendous pressure on China to play by the established trade rules. We all get dazzled by the growth of Asian Tigers, China, etc., etc., particularly in terms of their trade performance (don’t get distracted by short term gyrations — I’m talking medium to long term…). Because they appear to be economies “on the way up” we all want to cosy up to them and sell them our goods and services. But as I point out in my latest column for the Globe’s Economy Lab feature in the ROB, that neglects an equally vital and perhaps even more important trading relationship between nations — the international market for quality corporate assets, otherwise known as Mergers and Acquisitions (M&A). And here it is not the Asian countries that lead the world, but the major industrialised economies, with the biggest relationship in the world being between the US and the UK. This increasingly tightly integrated trans-Atlantic business relationship is poised to lead the world. Don’t count out the Anglosphere yet! And Canada should be doing more to follow this lead…. For the longest time Canada’s O&G industry reaped the benefits of having privileged access to the US market, serving regions that found it difficult or costly to bring in oil from other sources. But we assumed these golden conditions would last forever. They didn’t. Now instead of a cosy preferred supplier relationship with the US, the fracking revolution plus inadequate piupeline capacity is forcing us to sell our production at a painful discount to world prices–and the world price is low enough as it is! This is an object lesson in how canada traditionally manages its economic vulnerabilities, but shouldn’t, as I argue in my column for the 26 September edition of the Ottawa Citizen and other Postmedia papers. As the Koch brothers and their friends publicly contemplate spending nearly $1bn in the 2016 US election cycle (about the cost of a major presidential campaign) to reward their political friends and oppose their enemies, the extent to which money dominates US politics is on display for all to see. The dependence on money the US political system imposes on virtually all politicians, successful and less successful, is in marked contrast to Canada, where the major parties spent roughly $20m each in the last general election campaign. Does this affect our respective politics? You bet. I lay out just a few examples in my latest column for the Ottawa Citizen and other PostMedia newspapers. One of President Obama’s recent themes in his criticism of the Keystone XL pipeline is the dismissive comment that it will transport “Canadian oil”, as if that were obviously a matter of total indifference to America and his own goal of energy independence. Nothing could be further freom the truth. As I argus in my latest column for the Globe’s Economy Lab feature (in the ROB), there are all kinds of reasons why Canada’s oilsands production is a valuable compelement to America’s fracking revolution.